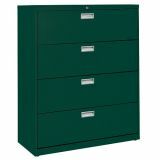 Aluminum handles with steel-reinforced drawer fronts, full drawer extension using three telescoping sections operating on steel ball bearing slide suspension are among the many features of the 600 series lateral file cabinets. 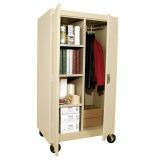 This durable steel lateral file cabinet has two drawers that accommodates letter/legal files using side-to-side hanging rails. Rolled-edge drawer sides for strength, rigidity and safety. Anti-ripping interlocking system and counterweight allows only one drawer to open at a time. Includes four adjustable glides and center lock that securely locks both sides of each drawer for positive security (2 keys provided). Powder coat finish. 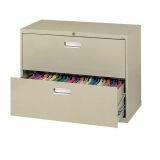 Aluminum handles with steel-reinforced drawer fronts, full drawer extension using three telescoping sections operating on steel ball bearing slide suspension are among the many features of the 600 series lateral file cabinets. 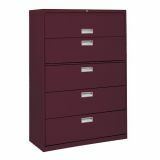 This durable steel lateral file cabinet has four drawers that accommodates letter/legal files using side-to-side hanging rails. Rolled-edge drawer sides for strength, rigidity and safety. Anti-ripping interlocking system and counterweight allows only one drawer to open at a time. 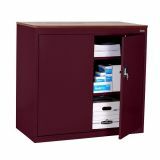 Includes four adjustable glides and center lock that securely locks both sides of each drawer for positive security (2 keys provided). Powder coat finish. Aluminum handles with steel-reinforced drawer fronts, full drawer extension using three telescoping sections operating on steel ball bearing slide suspension are among the many features of the 600 series lateral file cabinets. 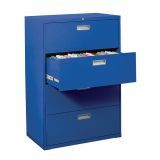 This durable steel lateral file cabinet has four drawers that accommodates letter/legal files using side-to-side hanging rails. Rolled-edge drawer sides for strength, rigidity and safety. Anti-ripping interlocking system and counterweight allows only one drawer to open at a time. Flip-front top drawer has a posting shelf. 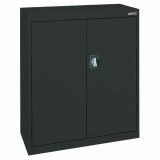 Includes four adjustable glides and center lock that securely locks both sides of each drawer for positive security (2 keys provided). Powder coat finish. 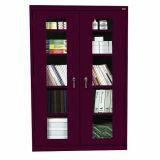 Durable plexiglass doors provide full visibility of contents. Shelves are fully adjustable on 2" centers plus raised bottom shelf. Three point door locking system. Meets ANST/BIFMA self standards. Shipped assembled. 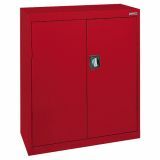 Combination cabinet is made of heavy gauge steel with recessed three point locking handle, welded steel construction and durable finish. 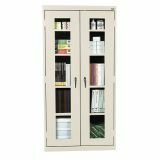 It features an 18"W clothes hanging area, 18"W general storage area, 3 adjustable shelves, 4 shelf spaces. Outside dimensions: 36"W x 24"D x 66"H. Cabinet dimensions: 60"H. Rolls on casters.